While waiting in line at Salumi (Italian so good, there are regularly hour long lines in front of the store), i was watching Nova’s Fabric of the Cosmos: Quantum Leap. In the process, I just realized that w/ the concept of teleportation – Stargate is more correct than Star Trek! 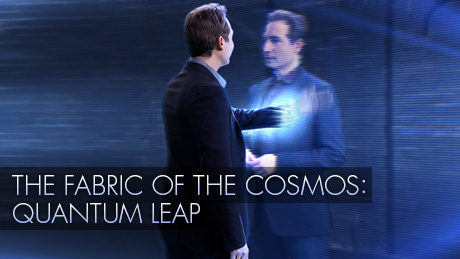 The basic fundamentals here of quantum entanglement are best left to Brian Greene in the The Fabric of the Cosmos: Quantum Leap. But the basic idea is that quantum physics has an observer effect problem where the location of a particle such as an electron is not a certainty – but a probability. The great physicists Neils Bohr and Albert Einstein were at odds with each other because Einstein believed that physics could be defined with absolute certainty such that the location of an electron would be known (via the mathematics of classical physics or relativity). Meanwhile, Bohr theorized through the mathematics of quantum physics that it is only at the point in time when we observe the particle do we identify its location. Until we observe it, we can only determine its probable location. FLATOW: Yeah. And simply stated, it’s have – if you entangle two particles, what do they do? Mr. SIEGFRIED: Well, it’s as though two particles separated from birth somehow know what to do when something happens to the other one. The confusing thing is if these particles fly off, say with – and you’re going to measure how they’re spinning, they don’t have a definite answer to that question until you measure it. So even though they don’t start out with any property, when one of them gets the property by a measurement, the other one suddenly has it as well, no matter how far apart they are. And that is, I think, spooky. As noted in Quantum Spookiness Spans the Canary Islands, in which the scientists were able to transmit entangled photos 144 kilometers between La Palma and Tenerife. And this was done back in 2007! As a side note, if you want a great video of the Milky Way Galaxy from El Tiede (Tenerife) on the Canary Islands, check out TSO Photography’s The Mountain. Why is this concept important within the context of teleportation? The theory is that teleportation can be possible by using quantum entanglement and spooky action from a distance. For the specific excerpt, check out Tangled Up in Teleportation. The basic idea here is that you would need two scanning pads in the two different locations (in the Fabric of the Cosmos, acclaimed physicist and author Brian Greene is going from New York to Paris), which would perform the task of scanning a set of entangled particles in the New York and Paris scanning pads. Upon stepping into the New York scanning pad, the scanner would perform the task of scanning the entire quantum state of all of the particles that make up the transportee. Because the particles in New York and Paris are entangled, the information (i.e. the quantum state of the particles) could be compared, observed, and modified such that the entangled particles in Paris would become the person originally standing in the New York pad (i.e. not a replica). This is important to note, because the act of scanning involved the quantum state of the particles and the teleportation had used entangled particles, the act of observing and changing the particles would produce an Brian Greene himself now in Paris. The particles in New York would disintegrate in the process. This is also important because the question of “What am I” is then not the atoms and particles that make us up – it is the information or data (quantum state) that define what we are. Its an interesting an awesome theory as it has some mind-blowing concepts of what we are and how teleportation can work. Focusing on the teleportation aspect, why is Stargate more correct than Star Trek? The concept of teleportation and quantum entanglement requires two sets of entangled particles – one in the source and one in the target location. You need to contain and scan BOTH the source and target locations so that its possible to know the existing quantum state of the entangled particles and the person or object being teleported. So right here, if you’re an avid Star Trek fan (and I am) – you know there is a problem here. Star Trek transporters have the ability to transport users from the ship to a planet’s surface where the latter has no scanning pad. Meanwhile, in Stargate – the method of transportation is to go through two portals – analogous to two scanning pads. The stargates themselves could be scanning mechanisms that allow one to control and contain entangled particles. Upon their activation, it would then be possible to transmit a massive amount of information (i.e. the quantum state of the people and objects entering the portal) from one gate to the other. The question would be then how to transmit the information (i.e. the quantum state) itself. Could the information itself be transmitted through another set of entangled particles. Or another way would be ala Stargate where one could create a stable wormhole between the two gates so that the quantum state (i.e. the information making up the people and objects themselves) could be transmitted faster than light. What is interesting is that through the course of writing this post, I realized how it may be possible for Star Trek transporters use entanglement. Okay, how about if the concept of a Star Trek transporter itself was some quantum vessel ala Star Trek: TNG –Relics such that the scanning of the target location can be done from a distance. Perhaps by using a different set of entangled particles it would be possible to transmit the information of the transportees from transporter pad on the ship to the planet’s surface. But the problem is still how could one create a stable quantum container or vessel to hold the particles from a distance? After all in Relics, the quantum vessel that Scotty was stuck in was within the transporter buffers themselves. About the only safe conclusion that can be made from this post is that I have way to much time on my hands since I actually thought about all of this over the weekend AND I bothered to post it AND I bothered to debate myself on my suppositions. Quantum physics is awesome – so read up on it, eh?! Scotty is right – as per the rebooted JJ Abrams Star Trek (awesome!) – you can beam an object over fast vast distances provided you can find the shared set of entangled particles. Outside of that – please debate and critique away! In the process of writing this post, I just realized that it may be possible to time travel using this quantum entanglement. After all since time is an illusion (as per The Fabric of the Cosmos : The Illusion of Time), I’m not sure there is anything that prevents entangled particles from being from different times (and its an illusion anyways).